Craig Johnson’s “The Skeleton Twins,” winner of the Best Screenplay award at the Sundance Film Festival, is a unique dark comedy-drama that makes for quite the change of pace for its stars – both of whom are best known for their work on a late-night comedy show. “Saturday Night Live” alums Kristen Wiig and Bill Hader play Maggie and Milo Dean (respectively), two twins who reunite after 10 years when Milo, a struggling gay actor in Los Angeles, attempts suicide, inadvertently thwarting her sister’s attempt on the same day. While he recovers, Maggie invites her brother to move in with her and her husband (Luke Wilson), where the two siblings reconnect and confront their many personal demons, including Maggie’s anxiety towards having a child and Milo’s attempt at rekindling a relationship with his high school English teacher (Ty Burrell). This is a film that really succeeds on the strength of its characters, all of whom are fully fleshed-out in a way that makes them relatable to the audience. Maggie and Milo are clearly not perfect, and the script knows it – they have plenty of problems, but find it easier to lie about them to others, which may make other people feel better, but ends up hurting themselves in the process. While this behavior could easily draw comparisons to characters audiences could consider unlikeable, Johnson and his co-writer Mark Heyman add an extra layer of vulnerability to their protagonists, making it easier to connect on an emotional level. Even Maggie’s husband, normally portrayed as constantly upbeat and positive, finds himself reaching this level when he finds out about Maggie’s secrets. By giving this much depth to everyone on screen, Johnson and Heyman create a series of characters that remain engaging to follow for the entire runtime. These characters may be great on their own, but they are emphasized by some very remarkable performances. Hader and Wiig have some of the best chemistry in perhaps any film this year, which would make sense given all of the time they spent on television together. Whether their characters are going through a life crisis or just having a good time as siblings – their lip sync to Starship’s Oscar-nominated song “Nothing’s Gonna Stop Us Now” is a particular highlight – these two are absolutely electrifying on screen together. For Kristen Wiig to be taking on a part like this is not a surprise – she has been making a transition into dramatic roles for a while now with films like “Girl Most Likely.” The real surprise comes from how easily Bill Hader manages to adapt to this new scenario. Milo is a far cry from Hader’s popular SNL character Stefon, but Hader refuses to let the two characters mix, giving the former an added touch of humanism that makes him stand out. 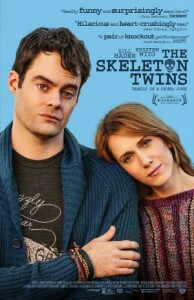 While “The Skeleton Twins” may not be for the most squeamish – the film is much darker than the trailer implies – it nevertheless makes for a fully engaging piece of cinema, and one that makes its stars ones to watch out for.